The promise of new life is a precious gift, and expecting parents often have many worries and concerns for their babies both before and after delivery. Necrotizing enterocolitis is a serious disease that can be present at birth or within the first few weeks following. This condition initially affects the intestinal walls, but can quickly develop into an infection that spreads throughout the body. It is important to know the signs and symptoms for early detection and treatment options, and to identify the possible necrotizing enterocolitis causes. Necrotizing enterocolitis itself is a dangerous condition. Progression of this disease can lead to extensive permanent damage to the intestinal, bowel, and stomach linings. Any problems in these areas can lead to more serious complications such as digestive disorders and widespread infection. Let’s learn of the underlying impact of necrotizing enterocolitis. Necrotizing enterocolitis refers to the death of damaged cells within the intestine. To breakdown this medical term, necrotizing signifies cell damage and death, entero is the intestine, and colitis is the inflammation of the colon, which is the large intestine. This disease targets the damaged tissues in the lining of the intestine, which results in the whole intestine becoming inflamed. This inflammation causes the intestine to malfunction, and as the disease progresses, the damage can cause a hole to form in the intestine. Any bacteria particles in the intestine may then escape into the abdomen and bloodstream, and cause infection to spread quickly throughout the body. Over the past century, this condition has plagued preemies and newborns, and has become the most common gastrointestinal condition in babies. It is seen in 60% to 80% of all premature cases, and in 10% of full-term births for infants weighing less than four pounds. Who Is at Risk for Necrotizing Enterocolitis? Necrotizing enterocolitis is seen within the first few weeks of life. 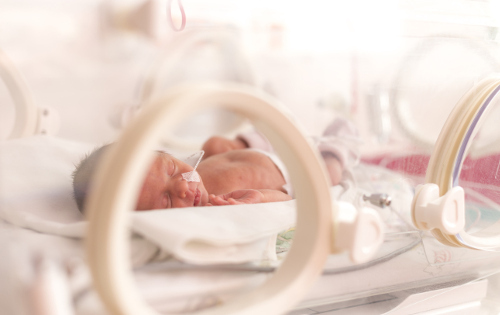 Most cases affect preemies born before 32 weeks of gestation, but it can be seen in full-term newborns if they present other serious health conditions or are at a low weight. This causes issues with proper circulation, proper digestion, and combating infections. Although a rare condition, necrotizing enterocolitis is known to be prevalent in premature newborns receiving formula, whether orally or through a feeding tube. The chances for developing this disease are little to none with babies receiving breast milk. Low oxygen levels at birth can also put babies at risk, as any oxygen and blood is naturally drawn from the intestinal tract toward the vital organs that require more. Preemies at risk can also include those born with excessive red blood cells, those who have received blood transfusions, and those with gastrointestinal infections. The exact cause of necrotizing enterocolitis has yet to be determined. Aside from the aforementioned risk factors, premature babies may develop this condition with weak intestines and lungs at birth. Babies born early may have underdeveloped intestines as well as other underdeveloped organs. Any bacteria entering the intestine will damage the tissue cells. Essential blood and oxygen are less likely to be easily transported throughout the body. This can lead to digestive problems and an inability to fight new infections. If the signs are present, a doctor will conduct a physical examination, including checking the belly for distention and tenderness. An abdominal X-ray will be required for an internal view of any inflammation or other issues with the intestine. Any signs of bubbles may indicate gas or air pockets within the abdomen, intestine, or liver. By inserting a needle in the cavity of the abdomen, the doctor can check for any presence of intestinal fluid. This fluid would indicate a tear or hole in the wall of the intestine, caused by necrotizing enterocolitis. Other diagnostic tests may include a complete blood count to determine the cell count of the blood. A low platelet count or an excessive amount of white blood cells may imply necrotizing enterocolitis. An examination of the stool, known as a stool guaiac test, may also be done to check for any presence of blood. Early diagnosis and treatment of necrotizing enterocolitis is crucial to prevent further damage and complications. Depending on the symptoms and severity of the damage, treatment is based on the infant’s age, weight, existing health condition, stage of the disease, and their physical ability to tolerate procedures and medications. The treatment may include limiting or discontinuing the present type of feeding; the insertion of a nasogastric tube, which will maintain an empty stomach; the administration of intravenous fluids for all nutritional needs; providing antibiotics to clear up any possible infections; and offering oxygen or a mechanical ventilator to assist with breathing. Serious cases may require blood transfusions or surgery to remove a portion of the intestine or bowel, or to attach an ostomy bag. Without a definite cause, prevention of necrotizing enterocolitis is challenging. Some of the precautions may include feeding newborns human breast milk instead of formula, adding probiotics to the diet, and introducing feedings at a slow pace. Another intervention is administering feedings enterally. This involves targeting the stomach, intestines, and esophagus by oral, rectal, or sublingual administration. Necrotizing enterocolitis requires immediate medical attention to prevent further complications of a body-wide spread of the infection and even death. As it affects preemies and those infants with a low-birth weight, early detection is key. Several symptoms can be seen such as a distended stomach and discoloration. Treatment factors in all symptoms as well as the severity of the disease. Surgery is done as a last resort as the damaged portions of the intestine may need to be removed. “Necrotizing Enterocolitis,” Beaumont; https://www.beaumont.org/conditions/necrotizing-enterocolitis, last accessed July 13, 2017. “Necrotizing Enterocolitis,” Healthline; http://www.healthline.com/health/necrotizing-enterocolitis#overview1, last accessed July 13, 2017. “What Is Necrotizing Enterocolitis?” Web MD http://www.webmd.com/parenting/baby/what-is-necrotizing-enterocolitis#1-2, last accessed July 13, 2017. “Necrotizing Enterocolitis Treatment”, University of California San Francisco; https://www.ucsfbenioffchildrens.org/conditions/necrotizing_enterocolitis/treatment.html, last accessed July 13, 2017. “About Necrotizing Enterocolitis,” Kids Health; http://kidshealth.org/en/parents/nec.html#, last accessed July 13, 2017.